Veteran Glentoran goalkeeper Elliott Morris has played over 700 games in his career, unsurprisingly failing to find the net once. But that did not stop him trying his luck from 70 metres out in his side’s Northern Irish Premiership clash with Derry-based Institute FC. Ten minutes into the match at Brandywell Stadium, 37-year-old Morris spotted his opposite number Martin Gallagher off his line, and let fly with an audacious effort that was fumbled into the goal by the furiously backpedalling Institute stopper. “It’s a bit surreal, tell you the truth,” Morris told BBC Radio Ulster after the match. “I looked up and I saw him on his 18 yard line. “I had a bit of wind behind me and I basically just put my foot through it, and luckily it went in. 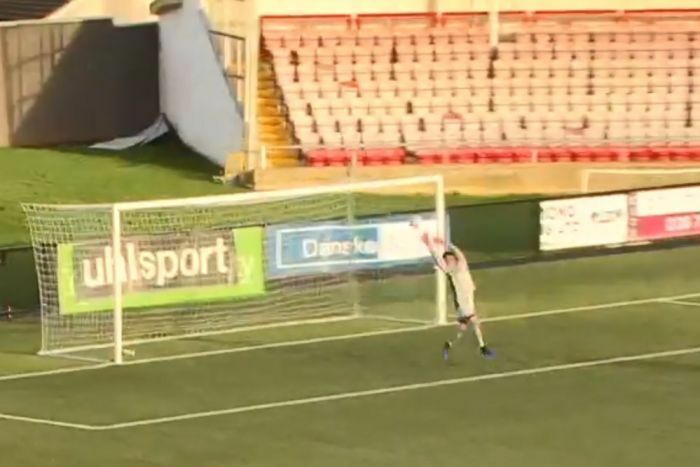 Not one to let his new-found goal scoring exploits go to his head though, the former Northern Irish under 21 goalkeeper said he was still more satisfied with stopping Institute scoring at the other end. “I’m more happy with the clean sheet, if I’m brutally honest,” Morris said. It is pretty rare that one player would score his first professional goal from inside his own half. For two to do it on the same weekend is down right crazy. QuestTV tweet: David Beckham? Wayne Rooney? No, this comes from SkyBetLeagueOne! But that is exactly what 17-year-old Southend United debutant Charlie Kelman did, getting his senior career off to a flying start with a spectacular goal in England’s third-tier competition. Kelman fired home from inside his own half in a 3-2 League One defeat against Plymouth Argyle. Called into Chris Powell’s side from the youth team after the seniors suffered a litany of injuries, Kelman more than repaid his manager’s faith with what fans are calling the best goal ever scored at Roots Hall. At 17 years and 71 days old, Kelman became the youngest debutant to score in Southend’s history and the club’s second youngest goal scorer of all time.